South Carolina Finally Enacts Texting While Driving Ban - Harrison White, P.C. Even though Gov. Nikki Haley signed a bill into law this week that makes South Carolina the 49th state in the country – and the last state in the South – to limit texting while driving, some say the ban could have gone further to prevent distracted driving accidents. The statewide ban passed the House 94-2 and the Senate 42-2 on June 4. On June 9, the governor signed the bill. It takes effect immediately and supersedes 19 local distracted driving ordinances that have been enacted across South Carolina, including Greenville, according to the Associated Press. What Does the New Anti-Distracted Driving Law Accomplish? As The State reports, the new law represents a compromise between House and Senate versions of bills that had been bandied about throughout this legislative session. You can read the final version of the bill that was signed by the governor, S.B. 459, by going here. It applies to the use of hand-held “wireless communication devices” such as phones, personal digital assistants, tablets or other types of computers. It does not apply to the use of hands-free devices. That’s an important distinction. 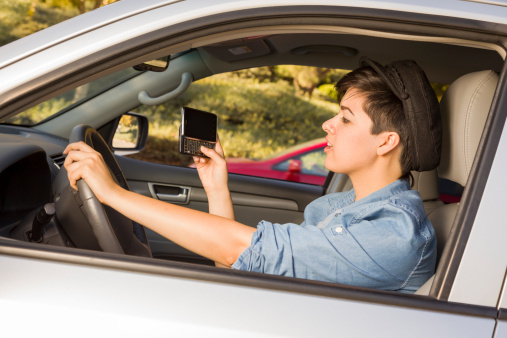 It generally prohibits drivers of all ages from composing, sending or reading a text-based communication while operating a motor vehicle on South Carolina roads. Using a hands-free wireless electronic device. Law enforcement officers can pull over drivers for violating the ban. However, the officer can make the stop only if the officer has probable cause to believe the driver is violating the law based on the officer’s “clear and unobstructed view” of a person who is using a wireless electronic communication device to compose, send or read a text-based communication while operating the vehicle on a public street or highway. The officer cannot not seize, search, view or require forfeiture of the device. For the first 180 days after the ban takes effect, police can only issue warning tickets. After that period, a first-time violation will carry a $25 fine. Repeat violations will carry a $50 fine. A violation is not a criminal offense. Does the Texting While Driving Ban Go Far Enough? Distracted driving has become a serious public safety issue. In fact, in 2014, 3,179 people were killed and 431,000 people were injured in the U.S., according to the latest numbers from Distraction.gov, the U.S. government’s official website for distracted driving. For this reason, many welcome the new law in South Carolina and see it as a progressive step to reduce or eliminate distracted driving crashes in our state. At the very least, it can be seen as recognition by lawmakers that it is unreasonable to text while driving. Tom Crosby, a AAA Carolinas spokesman, told The State that he thinks the bill could especially have a deterrent effect among young drivers. However, there are valid arguments that the law does not go far enough. For instance, it only prohibits the use of hand-held devices. Many studies have shown that using hands-free devices can be dangerous as well. Also, as Rep. B.R. Skelton (R-Six Mile) suggested to the Associated Press, a possibly more effective law would have banned talking on hand-held cell phones in addition to texting while driving. It will be important to study the number of citations issued in the coming years, the age and gender of ticketed drivers and where the tickets are issued. This information will help in targeting anti-distracted driving messages in the future. Additionally, it will be crucial to study whether a ban actually reduces texting accidents in our state or whether other measures should be considered. « How Much Do You Know About Your Local Social Security Disability Hearings Office?